Treat your mum this Mother's Day with a well-thought of, high-end luxury tea gift box. Designed and produced exclusively for Mother’s Day 2017, 'From the Heart – With Love' - is a beautiful collection of teas from Newby Teas of London and is sure to bring a smile to your mum’s face. 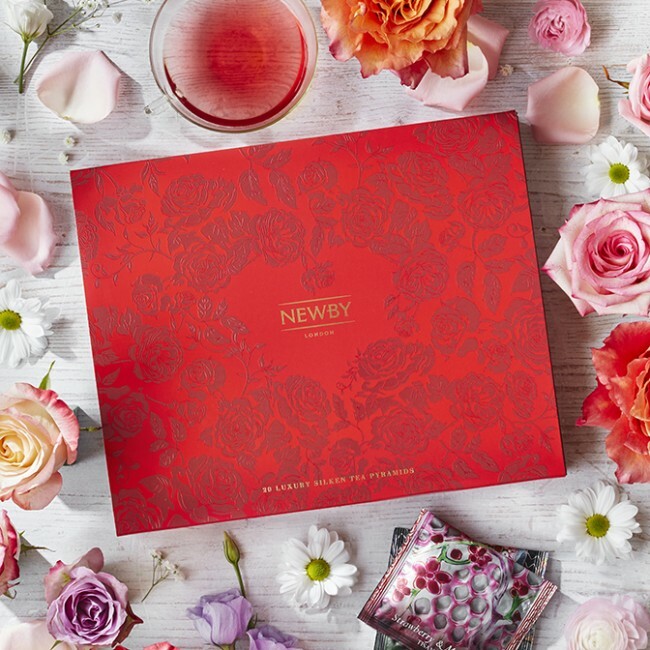 The selection of teas are packaged in an elegant box that features a red velveteen background and is embossed with exquisite wild roses, intertwined to create the outline of a heart. So beautiful! The packaging of the individually-wrapped sachets is equally lovely. There are five sachets of silken pyramids for each variant and I feel this collection of wonderfully varied teas is a convenient and lovely way to experience superior flavours of speciality teas. Strawberry & Mango - a succulent tisane, combining the two fruit flavours with a lingering light honey finish. Rooibos Orange – another tisane, which blends the nutty flavour of the rooibos shrub, grown only in the mountainous Cederberg region, with the sweet zest of oranges. Jasmine Princess – a green tea with a gentle floral finish. Hunan Green – another green tea from China’s celebrated Hunan Province, it contains fine leaves, twisted into delicate spirals for sweetness and energy. Depending on the type of tea you go for, each tea has a slightly different method of brewing - some need to be brewed for 2-3 minutes while others like the Strawberry & Mango need to be brewed for 6-8 minutes. My favourite of the four is Hunan Green followed by Strawberry and Mango at the second place. I love the subtle fragrance and the delicate, sweet aftertaste in the former and the lingering hints of sweet honey in the latter. Priced at £22.40, 'From the Heart – With Love' is available exclusively online at Newby’s e-boutique. This unique collection of delicious teas makes a great gift for the tea loving mum. So, what are you waiting for, got shopping now.